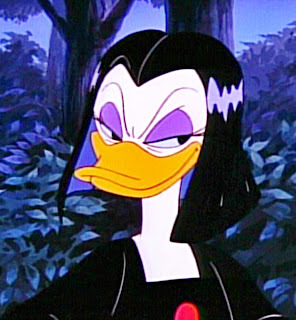 Disney's foulest female fowl, Magica de Spell, is the scourge of Scrooge McDuck, Darkwing Duck, and pretty much all righteous citizens of Duckburg and St. Canard. She can cast evil spells, goddamnit. That not bad enough? Wait till she throws her signature smoke bombs. So what to get a witch who has everything? Gold, gold, and more gold. For all her magical brains, Magica has yet to master the finer nuances of alchemy. She covets Scrooge's Number One Dime, which she believes could grant her the mythical Midas Touch. Stylistically, Magica de Spell is less Madame Mim (her BFF and housemate, incidentally) than Morticia Addams. Her illustrators and animators pay homage to Italian screen sirens like Gina Lollobrigida and Tura Satana. (Perhaps they give good duckface.) Not coincidentally, Magica lives on the slopes of Mt. Vesuvius in Italy. With her foiled attempts to steal Scrooge's cherished coin and abortive terror plots in St. Canard, Magica offers more comic relief than serious threat. But of course, you should have more common sense than taking a close gander at her when she's about to say "abraduckabra."